What could’ve been an exceptional social commentary falls into a rut of typical zombie mayhem. What does World War Z have that other zombie movies don’t? It’s got Brad Pitt; Marc Forster; excellent cinematography; a world full of hard-charging, fast moving zombies; and roughly $170-$200 million to make it happen. Unfortunately, the top-shelf talent fails to make something more of a fairly nifty spin on the zombie genre. There’s nothing unusual about the premise itself. There’s been a virus outbreak of some sort and it’s spread rapidly around the world. It’s unknown how it started or what it is, simply that whatever it is can be traced to South Korea. Things get a little more interesting when it’s reveled dedicated family man — loving husband and doting father — Gerry Lane (Brad Pitt, Fight Club) is a former investigator for the United Nations. He’s been to some of the world’s most dangerous locations — Liberia, Chechnya, Sri Lanka, Newark. He’s got the logistical and cultural chops to help a young doctor quickly drop into Camp Humphries in South Korea, gain valuable knowledge about the roots of the outbreak, then get back out to a safe zone and save the world. Great in theory. Sucky in execution. Things don’t go well on the mission and from there World War Z launches into what should’ve and could’ve been a heckuva thrilling globetrotting mission. Gerry’s next stop is Jerusalem, which has become the world’s safest place to be thanks to thousands of years of history and a mindset geared toward expecting the unfathomable. If only World War Z had the guts and the inclination to follow this line of thought more, the movie could’ve taken the whole notion of the zombie genre — which has its roots in pure social commentary to begin with — to a whole new level. There’s an interesting discussion in Jerusalem revolving around a concept called The 10th Man. If nine men agree on a conclusion, the rationale goes, then it is incumbent upon the 10th man to play the devil’s advocate and find holes in the mutually agreed-upon logic. And so it is, after a history of wall building and a people that’s endured the Holocaust and the events at the Munich Olympics, the 10th man latches on to a sketchy communique from India that indicates a zombie contagion is on the loose. There’s some mighty hot stuff in that setup and the execution of the scenes in Jerusalem provides some fantastic CGI-fueled visuals. Throngs of zombies build living ladders of the undead as they attempt to scale centuries-old city walls. Loud noise is one of the zombies’ bugaboos, and when the celebrations of long-divided cultures reach a crescendo, it very well might spell the beginning of the end. 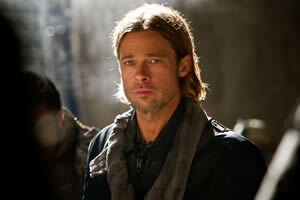 Alas, right when things appear to be headed higher and higher thematically and cinematically, World War Z collapses. The movie is based on the book World War Z: An Oral History of the Zombie War by Max Brooks (son of Mel Brooks, no kidding). As the title implies, the book is a sprawling tale told in the first-person, capturing the real-time tensions of a world going to Hell. Brooks has written several other books in this zombified world and it’s clear the intent is to spin this into a whole series of movies. That alone makes the ending a bit of a disappointment. There isn’t a sense of excitement about more to come, it’s a sense of being snookered into another multi-part saga that isn’t warranted. That ending features a voiceover by Pitt that sets the stage for continuing the war, but it’s a tone and approach that should’ve been used from frame one in order to better capture the tone of the book. Too much of the movie is typical Hollywood. There’s an oddball, gravity- and physics-defying accident on the streets of Philadelphia during the initial staging of the sweeping pandemic. Then Gerry and his family repeatedly fall into things all too conveniently. There’s an RV. Vroom. Let’s go. There’s a Mexican family hiding in their apartment — with the door wide open. Let’s get in. You wanna feed us and placate us with cerveza? Righteous. And Gerry is one of two survivors of a plane crash that — conveniently enough — finds them within walking distance of their destination, the World Health Organization’s office in Cardiff, Wales. Maybe it should all be chalked up to inflation, but $200 million should be able to buy a better script. There are plenty of great ideas. The wiz kid doctor describes Mother Nature as serial killer who desperately wants to get caught. The cultural level-resetting of the zombie pandemic could be taken in all sorts of directions. And yet, at virtually every turn, despite a setup of enormous magnitude and possibilities, the movie’s slew of four screenwriters repeatedly concoct and execute upon the path of least resistance — and creativity. At least director Marc Forster has his shining moments. There are times when World War Z achieves for zombie movies what Forster did for James Bond in Quantum of Solace. That Bond flick took the spy franchise to a whole new level of cinematic style and panache. Here, Forster and cinematographer Ben Seresin (Transformers: Revenge of the Fallen) relish in creating loads of atmosphere. There are those wet, murky streets of Newark. The clammy, tiled hallways of a cheap apartment complex. The hot, dusty streets of Jerusalem. And sometimes the 3D is pretty darn good. Visually, there’s a lot to like. Alas, like so many big-budget movies these days, there’s also a lot to be desired. Damitha: "He’s been to some of the world’s most dangerous locations — Liberia, Chechnya, Sri Lanka, Newark. "